Reglan (met-oh-kloe-PRA-mide) is a medicine that increases the movements or contractions of the stomach and intestines. When given by injection, it is used to help diagnose certain problems of the stomach and/or intestines. It is also used by injection to prevent the nausea and vomiting that may occur after treatment with anticancer medicines. Another medicine may be used with Reglan to prevent side effects that may occur when Reglan is used with anticancer medicines. When taken by mouth, Reglan is used to treat the symptoms of a certain type of stomach problem called diabetic gastroparesis. It relieves symptoms such as nausea, vomiting, continued feeling of fullness after meals, and loss of appetite. 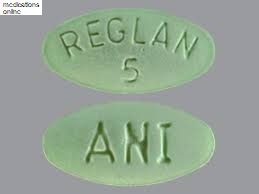 Reglan is also used, for a short time, to treat symptoms such as heartburn in patients who suffer esophageal injury from a backward flow of gastric acid into the esophagus. Reglan may also be used for other conditions as determined by your doctor. Medicines or medical conditions may interact with this medicine. INFORM YOUR DOCTOR OR PHARMACIST of all prescription and over-the-counter medicine that you are taking. DO NOT TAKE THIS MEDICINE if you are also taking cabergoline or pergolide. ADDITIONAL MONITORING OF YOUR DOSE OR CONDITION may be needed if you are taking serotonin reuptake blockers such as sertraline or venlafaxine; monoamine oxidase inhibitors (such as furazolidone, linezolid, moclobemide, phenelzine, procarbazine, selegiline, isocarboxazid, tranylcypromine); narcotic pain medicine; anticholinergic medicines that slow down gastrointestinal movement; certain medicines for mental disorders (such as phenothiazines or haloperidol); or insulin. DO NOT START OR STOP any medicine without doctor or pharmacist approval. Inform your doctor of any other medical conditions including asthma, Parkinson`s disease, high blood pressure, diabetes, congestive heart failure, depression, allergies, pregnancy, or if you are breast-feeding. USE OF THIS MEDICINE IS NOT RECOMMENDED if you have a history of gastrointestinal bleeding, blockage, or tear; seizures; or pheochromocytoma. Contact your doctor or pharmacist if you have any questions or concerns about using this medicine. This medicine will add to the effects of alcohol and other CNS depressants (medicines that cause drowsiness). Some examples of CNS depressants are antihistamines or medicine for hay fever, other allergies, or colds; sedatives, tranquilizers, or sleeping medicine; prescription pain medicine or narcotics; barbiturates; medicine for seizures; muscle relaxants; or anesthetics, including some dental anesthetics. Check with your doctor before taking any of the above while you are using this medicine. This medicine may cause some people to become dizzy, lightheaded, drowsy, or less alert than they are normally. Make sure you know how you react to this medicine before you drive, use machines, or do anything else that could be dangerous if you are dizzy or are not alert. Copyright 2000-2018 Medications-Online.com. All rights reserved. Names of actual companies and products mentioned within this website may be the trademarks of their respective owners.